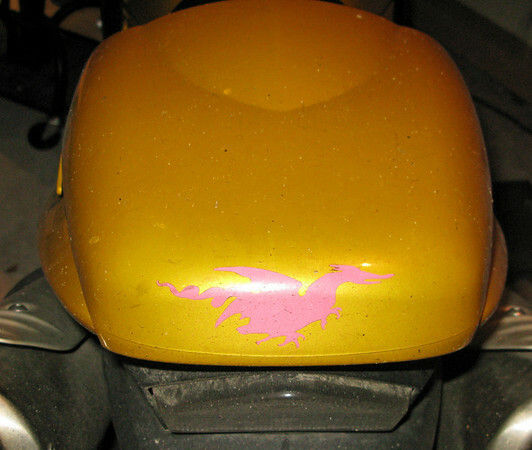 Other than a single pink Deals Gap dragon sticker on the seat cowl of my Speed Triple, I don’t have stickers on my motorcycle. Instead I have started to put them on the interior door of my garage. There is plenty of space to use and it offers a little more permanence. Every time I walk in and out of the garage, I get a nice visual reminder of some of the places that we’ve been. Of course, I only wish that I’d stuck so many past mementos here. When traveling, I also make it a point buy postcards. They offer the most “perfect” photos of places. Keep a few stamps in your wallet while on the road and send yourself a postcard with notes from the trip. Looking through your card stack on a dreary winter day will bring a smile to your face. Do you collect anything from your travels? Spoons, tshirts, shot glasses? Tell us about it! Lisa and I were collecting Pins from places and states, I think we lost more than we have now. 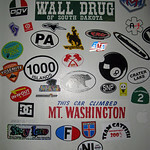 I like collecting old-fashioned travel decals from Impko and Baxter-Lane, but they’re hard to come by. 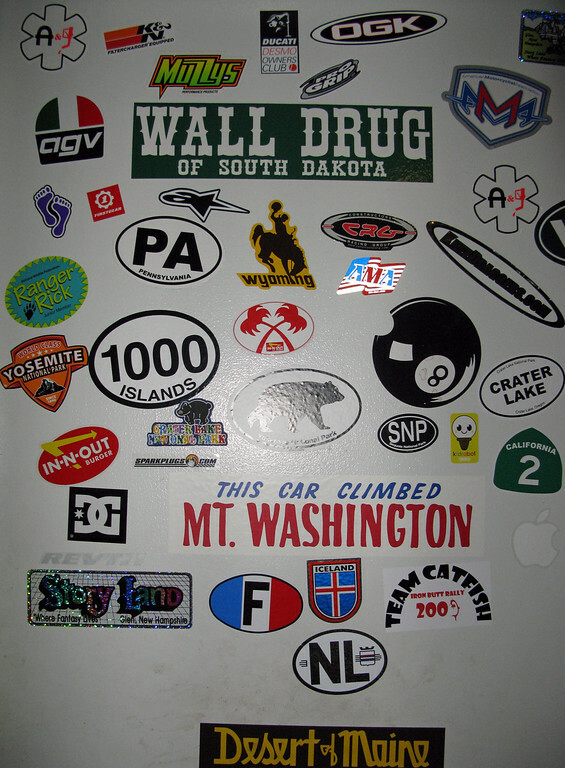 I’ve got some on my car and a lot of people like them… reminds them of trips they took when they were kids. I like the new look for the site. It loads faster and is easier to read. Veryfine. We only have a few stickers on the Guzzi’s flyscreen, one of which causes great confusion when travelling through Europe. Many of the stickers are of flags from countries that we have visited. When travelling Guzzisue likes to take a notebook and this becomes our holiday journal. In this she may put postcards or information leaflets about the places we have visited. Ma&Pa eatery. We never eat out at the big food chains. So I guess we take home extra pounds. lol.